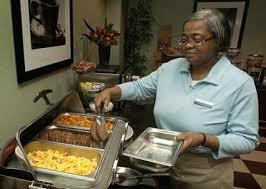 I want to be a breakfast hostess at a nice hotel when I retire. While my daughter, her two friends, and I attended the International Conference on Missions (ICOM), we stayed at a Wingate Inn. The name similarity is only consequential but our family has a lot of fun watching the consternation of desk clerks. 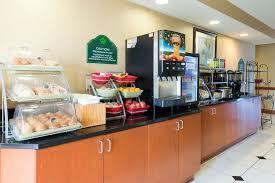 Fortunately, the breakfast clerk didn’t know my last name. I don’t think it would have mattered. This woman downright spoiled us. She picked up our dishes, asked if she could get us anything, brought me a lid for my to-go cup without my asking, and offered to get a plastic bag to protect my ICOM program guide from the rain. She greeted us both mornings with a smile and asked us if we had slept well. 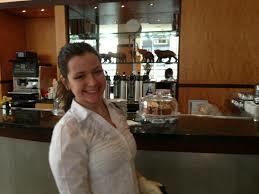 Breakfast servers who go beyond replenishing food trays. I cry easy, what can I say? I mostly cry when people do nice things for me during times of stress. For three long weeks, I’d been caring for a sick husband while trying to nurture the women in my church and plan my daughter’s wedding. I came to the conference exhausted and nearly on empty. Having someone care for me, even such a small thing as getting a coffee cup lid, was so nice. It’s easy to believe that the preachers, song leaders, praise teams and bible study leaders are the important people in God’s kingdom. As a bible study teacher and worship leader, I can tell you that is so not true. We need everyone. Behind-the scenes people are actually the most important people. Without them, the up-fronters, as we call them, could never fulfill their jobs. All of us need encouragement, care, and pampering. You never know what someone might be facing and the burdens they shoulder. Your random act of kindness, or expression of concern might be the one thing that diffuses the time bomb of stress about to explode in a stranger’s life. Thanks Breakfast Room lady! You made my day. Caring for others’ needs can become a ministry of its own. Wow! Think of the good that would spread if every Christian approached their job with that outlook. How can you turn your job into ministry? Pray for the people that intersect your path. Determine to do one random act of kindness a day. Show interest in one other person’s life events each day. Show appreciation for the people who show kindness to you. Megan led us in writing a thank you note to Pat, our server, and bought her some flowers. The smile on our hostess’ face warmed our hearts and filled us with joy that lasted long after we checked out of the Wingate Inn. And to think it started with the offer of a coffee cup lid. What small act of kindness can you do for someone within the context of your job today? Violence in Dallas. Violence in Baton Rouge. Where do we start to push back the violence? One family’s solution: Thank the officers who sacrifice their lives to keep us safe. twinkly eyes, mischief all over, and I taught him. giving him a safe environment to learn. and day after day he risks his life to protect me. Strange how life can change. All around us threats of violence churn. Blood has been shed. Lives lost. That night I tossed and turned. The next morning very early I spoke with my girls and presented an idea. A chicken sandwich for every office along with a handwritten note. “How many officers are there?” I asked my boy – now an officer. He is only one. There are a number of my former students serving as police officers. Daily risking their precious lives. Suddenly everything began to fall into place. The drive to Chick- fil-a was fast while we talked over our plan. Order 42 chicken sandwiches and then go to the nearby store to pick up index cards and markers. Together we sat at the table writing a simple message. White card with black lettering. Simple. Bold. Strong. Simple but there are no words to language how much care went into each card. 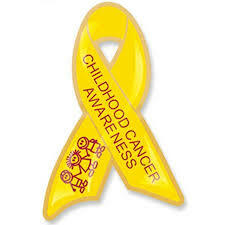 I thought of my boys and girls grown now and carrying burdens of our world. Once so innocent and filled with laughter. My heart overflows with thanksgiving for each officer. They take their place in an imperfect world and do what they can. and sometimes lay down their lives. What price do you place on that? A Light brightly shining proclaiming grace, forgiveness and peace to a fallen world. The aroma of those 42 chicken sandwiches filled with air as we taped a personal note on each one. and walked inside carrying the large container. there were no words to express. Eyes met eyes as we explained to the officer what we had done. Yes, he was another boy grown into manhood whom I knew from years ago. and that it was only the beginning. where there are no words to say how grateful we are for their sacrifice. Someone’s husband, wife, father, mother, uncle, aunt, etc. All of us connected. Moving together through this life. Let’s change our world. Will you join me? Yes Sharon, we will! Let’s do what we can to bring the peace of Jesus to our corner of the world. Remember my friend I’ve called Jacob? He’s lived in our small town and attended one school for an entire year. No school transfers! He’s going into eighth grade and doing well. He’s accepted Christ as His Savior, is involved in the youth group, and comes to our house frequently to ask challenging questions and tell us about his latest life-plans. And boy-howdy, some of those life plans are real doozies! He’s a generous young man with a heart of gold. Sometimes he doesn’t use the best judgement in that generosity but oh my, his heart is in the right place. And that’s why Jacob gets my Caught Being Good award. A half hour before my knitting group one Thursday evening, Jacob called me. 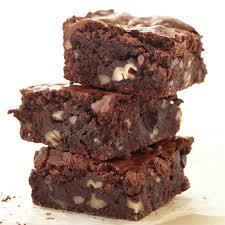 Could he come over to my house and make brownies? The stove in his house doesn’t work. I invited him to come to the church while I was at knitting group and he could make them while we knitted in the next room. Upon arriving and getting him set up with the supplies and ingredients he didn’t have, I watched him pull out three brownie mixes from a plastic shopping bag. “Who are you making all these brownies for?” I asked. One box was for a teacher who was retiring that year. Another was to make for all the ladies in the knitting group. And the last box was for my husband and me. I shouldn’t have opened my big mouth. I blurted out that I was allergic to chocolate and my husband was diabetic. Oh gracious, what do I say? I tried to tell him that life often isn’t fair and it really didn’t bother me to watch people eat something I couldn’t. The fact that he even thought of us was precious enough of a gift for me. I talked faster and slicker than a used appliance salesman to persuade him to go forward. He relinquished only after he assured me he would find something else for us. It came two weeks later on a Sunday morning when I was face down from eye surgery. I’d already had a revolving door of visitors and caregivers while the “Preacher Creature” was at church doing his sermon thing. Between the worship service and Sunday School, the doorbell rang. One of the ladies went to the door. It was David holding a plate of muffins. 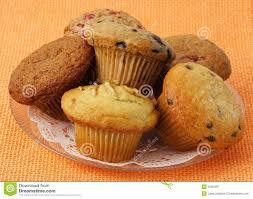 The church had put out muffins from a brunch held the week before, and Jacob had take full advantage of the bounty. He proudly held out the plate of muffins, not realizing I couldn’t see them. “I picked one of every kind for you,” he said, his voice beaming with pride and enthusiasm. I could envision this thirteen year old kid going down the line, filling that paper plate with muffins, and the older ladies, having no clue about his motivation, biting their lips to keep from telling him to not be so greedy. That’s probably what I would have thought. But David’s generous heart didn’t care about his reputation. He had nothing of his own to give me. The muffins were his for the taking. No one had put a limit on how many he could take. No one stipulated what he could do with those muffins once he put them on his plate. So he gave to me the gift of his free muffins. Like the young boy who gave away his lunch to Jesus, Jacob gave what he had to someone in need. I wish I had a picture of that plate of muffins to show you. If I hadn’t been face down, under doctor’s orders to not move, I would have taken a picture. If I’d had my brain and my spirit of gratitude working that morning, I would have asked one of my helpers to take that picture. But I bet God took a picture. And I bet that picture is hanging in Heaven’s gallery of fine art. One of His little ones gave away what most teenaged boys would have inhaled in less time than it takes to unwrap one muffin. Good job, Jacob. God knows who you are and He is smiling big time. As soon as I set my purse and Bible on a table in our church’s Fellowship Hall, I knew I was in trouble. A cluster of dark curly heads adorned with pink hair bands that coordinated with colorful shirts unraveled into a line that advanced and arced around my position. General Washington would have felt less fear from a Redcoat battalion. What are they selling? my brain prompted. I soon found out. My conquering heroines dumped on the table an array of their multi-colored terms of peace. The shooting began. Three sweet voices tumbled over each other. “There’s Riley, he’s ten and there’s . . . ” My rotating head picked up speed in synch with their words. I was losing track of the details. I come from a tradition that follows the legalism behind Jesus’ cleansing of the Temple. You don’t sell anything on church property. Church time is worship time. My house is a house of prayer, not a den of thieves, Jesus said. I was tempted to turn it into a teachable moment and tell my young entrepreneurs to come to my house tomorrow if they wanted to sell me something. Their rapid-fire words penetrated my brain. Who did they say this was for? Cancer patients. Three cancer patients. Kids. Kids they knew. These sweet little girls weren’t selling for their own profit. They weren’t even making money for the Girls Scouts. They hadn’t purchased their wares from Oriental Trading. They made the jewelry themselves so they could sell it to help their friends. Jesus healed on the Sabbath. Jesus challenged the Pharisees that they would even stoop to rescue a donkey from a well on a day of worship. If collecting money to heal three friends riddled with cancer and to rescue their families from the financial ruin of major medical bills isn’t the very definition of our spiritual service of worship and of grace and mercy, I don’t know what is. I fished in my wallet. “I’m not sure I have any quarters,” I hedged. I was still trying to get out of it. Some people have thick armor. 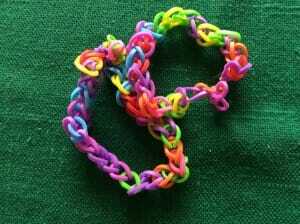 What would I do with hot pink multicolored elastic links anyway? I surrendered. Gladly. Joyfully. I bought two bracelets. I should have bought ten. Twenty. I should have bought them out. 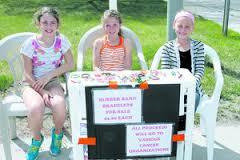 What’s a few dollars compared to three little girls doing whatever they can to help a friend? What purer form of worship could I express than a gift of mercy in Jesus’ name? Only later I heard my three angels in pink were brand new visitors to our church. Even though they had never attended before, this army of mercy had a better grip on grace than I did. I should have bought them out. Maybe it’s good that I didn’t. If I had, I would have deprived others the joy of worship. The crazy thing is, I could have done it. One twenty dollar bill would have emptied their box and gave them a memory for the rest of their lives. I would never miss that twenty dollars. Even more incredulous is that twenty dollars would be a drop in the bucket for what those families need. Yet, like the widow’s mite, God could do so much more with my gift in the lives of those three little salesgirls and those families. What a faith builder it could become for a widening circle of unseen observers. Just think of what my action would do for me. I really should have bought them out.